Nefeli Pension is located in the region of Ponti Vassiliki, Lefkada, and it is an ideal destination for surfers and family holidays. We are the only pension located so close to the sea (pension-garden-sand-sea), only 42-44 m from the water (depending on the season). We offer our clients free deck chairs, parking seats, space for the surfing equipment and wi-fi Internet. Children regardless of age are also free. Vassiliki Lefkada is only 2.5 hours by car from the port of Igoumenitsa and 1 hour from the airport of Aktion. 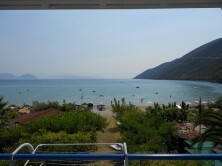 From the verandas you can enjoy the calmness and the shade, watch the boats sailing and the gulf of Vassiliki full of people surfing and enjoying their time!